Lamanai is the Spanish historic name for Lama’ an/ayin, which means “submerged crocodile.” Dr. David M. Pendergast, Curator Emeritus of the Royal Ontario Museum, directed a long-term archaeological research project at Lamanai between 1974 and 1986. During that period, over 940 structures were mapped, and approximately 85 have either been sampled or intensively excavated. During the course of this large-scale, ambitious project, Dr. Pendergast and his associates succeeded in defining the site’s chronology, settlement characteristics and range of material culture types and architectural features. This important research project documented the long duration of Maya occupation at Lamanai. Dr. Elizabeth A. Graham, Co-Principal Investigator for the Lamanai Archaeological Project, has directed research at Lamanai since 1997. Dr. Graham is at the Institute of Archaeology, University College London, and she has overseen the work of a number of researchers from North America and England at Lamanai. Her most recent work has been focused in the elite, Classic Period residential group called Ottawa. Dr. Graham can be contacted at tcrnegr@ucl.ac.uk. Currently Dr. Scott E. Simmons, University of North Carolina Wilmington, is Co-PI at Lamanai, directing the Maya Archaeometallurgy Project (MAP). Dr. Simmons also directs the field school in archaeology at Lamanai during May, June and July. You can contact him at simmonss@uncw.edu or at 910.962.3429. A number of other research projects are currently being conducted at Lamanai. These include work on ceramic technology and style, lithic technology, iconography, paleoecology, and others. All of the work at Lamanai is permitted through the Belize Institute of Archaeology, National Institute of Culture and History, Directed by Dr. Jaime Awe. The results of archaeological research revealed a long, unbroken sequence of Maya occupation at Lamanai through Preclassic and Classic times. Maize pollen recovered in sediments in the area known as “the Harbour” indicate that the first Maya peoples settled at Lamanai by roughly 1500 BC. Excavations in the vicinity of the project camp also revealed that Lamanai survived the demographic and sociopolitical collapse that occurred at so many other major Maya sites in the Southern Lowland area during the ninth century AD. Dating of several prominent structures near the lagoon indicated that not only did Lamanai continue to be occupied beyond this period of major cultural transformations, but in a great many regards life at the site during Postclassic times was as vibrant and dynamic as it had ever been. Lamanai was the focus of concentrated, yet intermittent, Spanish involvement beginning in the first half of the sixteenth century. Lamanai was an encomienda town. Encomiendas were grants of land and Indians given to Spanish conquistadors. In demographic terms the town was likely made up, at least partly, of runaway Maya who had been brought to the town during reducciones (forced re-settlements of recalcitrant Mayas to villages under nominal Spanish control) in the late 16th and early 17th centuries. Two Spanish mission churches were constructed at Lamanai. The first of these was built atop a Maya Tulum-style temple, probably sometime after a redución in 1544. After this time Lamanai became a visita mission, periodically visited by circuit-riding Franciscan missionaries. A number of Maya at Lamanai were baptized and buried in the cemetery adjacent to the larger, second church at Lamanai, which was probably built at the beginning of the seventeenth century. The Maya at Lamanai participated in several widespread rebellions against Spanish Colonial rule until 1641, when Fransiscan friars reported that the town had been burned and abandoned. The aim of the larger work of which the MAP is a part is to help provide additional insights into the both the transitions and continuities that characterized late precolumbian and Spanish Colonial Period life at this important Maya community. Following Spanish withdrawal from Belize in the eighteenth century, British interest in Lamanai revolved around an ill-fated millworks for sugarcane processing during the last quarter of the nineteenth century. A number of British workers and their families resided at Lamanai during the last quarter of the nineteenth century, oftentimes using ancient Maya house mounds as the bases for their own houses. Had the sugarcane operation been a successful enterprise, Lamanai may have been occupied for even longer. As it stands now, Lamanai bears the distinction of being the longest continuously occupied site in the Maya Lowland area. 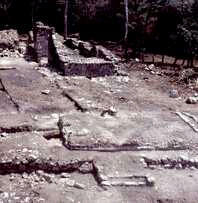 The Ballcourt at Lamanai with Str. N10-43 (High Temple) in background. View North.